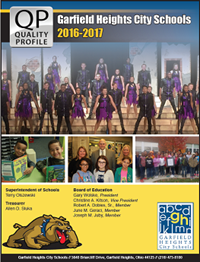 The Garfield Heights City Schools has released its 2016-2017 Quality Profile to the community, as a way to summarize the notable achievements in a variety of important educational criteria. Available by clicking nearby on the website and also in hard-copy format at each of the buildings, the Quality Profile gives the community the chance to see important academic accomplishments, arts involvement and community partnerships. In addition, the community can read about student leadership activities, updates in student services and also district finances. Please be sure to preview this Quality Profile by clicking this link below, or pick up a hard copy at the main office in any of our buildings. Bulldog Pride runs strong in the Garfield Heights City Schools, and we are certain that once you experience it, you will have such pride as well. Please contact us anytime with questions or concerns.